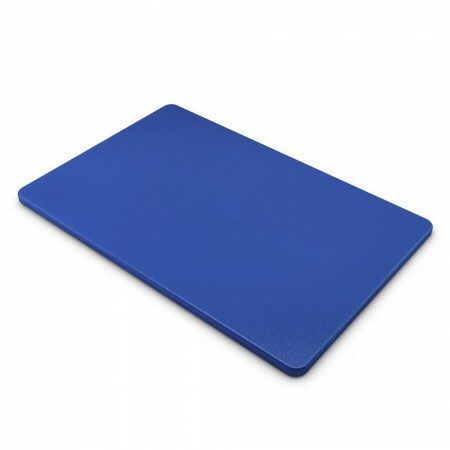 TigerChef Polyethylene Color Cutting Board 18" x 24"
TigerChef > Smallwares > Kitchen Utensils > Cutting Boards >< Plastic Cutting Boards > TigerChef Polyethylene Color Cutting Board 18" x 24"
$5.99 TigerChef Polyethylene Color Cutting Board 12" x 18"
$8.29 TigerChef Polyethylene Color Cutting Board 15" x 20"
Designed to protect your countertops and prevent cross-contamination, the TigerChef Polyethylene Color Cutting Board 18" x 24" is a must-have tool for home and commercial use. Crafted from polyethylene, this cutting board is durable enough to handle rigorous chopping with all types of knives while its non-porous design is easy to clean and resists odors and stains. This NSF listed cutting board is color-coded enabling you to prevent cross contamination by assigning each board to a specific food group: white for dairy, blue for seafood, red for raw meat, green for vegetables and fruits, yellow for poultry, and brown for cooked meat. $24.17 Winco CBXH-1824 White Plastic Cutting Board 18" x 24" x 1"
$20.64 Winco CBWT-1830 White Plastic Cutting Board 18" x 30" x 1/2"
$10.78 Winco CBH-1218 White Plastic Cutting Board 12" x 18" x 3/4"
$12.99 Winco CBXH-1218 Thick White Plastic Cutting Board 12" x 18" x 1"
$19.79 Winco CBH-1824 Thick White Plastic Cutting Board 18" x 24" x 3/4"
$17.33 Winco CBI-1824 Grooved White Cutting Board 18" x 24" x 1/2"
$8.51 Winco CBI-1218 Grooved White Cutting Board 12" x 18" x 1/2"
$24.79 Winco CBI-1824H Grooved White Cutting Board 18" x 24" x 3/4"
$228.55 Vollrath 5200311 Color-Coded Poly Cutting Board Set 18" x 24"
$44.02 Winco CBST-1218 Plastic Cutting Boards, Set of 6 Colors 12" x 18"
$87.34 Winco CBST-1824 Plastic Cutting Boards, Set of 6 Colors 18" x 24"